Apparently that day is today. 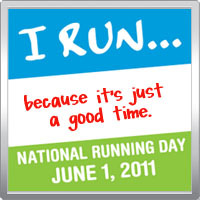 A day once a year for running. Just so happens to be on my REST DAY. Maybe I'll go run around the block after the husband gets home. I would throw all 5 kids in it and run down the road. and alter to fit me. I can "win" medals without actually winning. Seriously one of my top reasons for running- to get more medals. Don't judge. Okay, you can judge if you want- I don't care. also- I can feel good at it without being the best at it. at 4:45 in the morning and run. Doing something that most people never do- like running 26.2 miles. 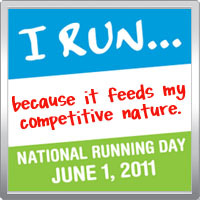 Yes, I run so I can eat. That's not the most shiny example, is it? and think "that wasn't so bad"
or even "I can do that again". Dare I say- even WANT to do that again. 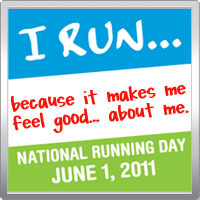 Happy running to one and all! 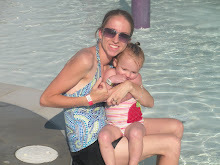 I found your blog on the circle of moms site! You are hilarious!! I absolutely agree....running is like childbirth. You somehow forget the pain when you think about it!